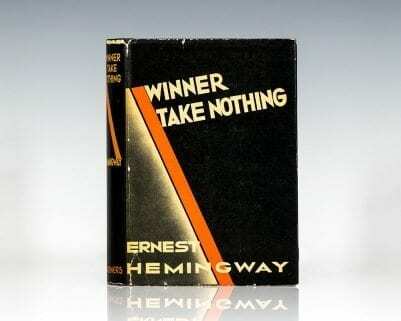 First English edition of this posthumous work Hemingway. Octavo, original cloth. Name to the half title page, near fine in a near fine dust jacket. Jacket design by Hans Tisdall. Ernest Hemingway’s classic memoir of Paris in the 1920s, A Moveable Feast remains one of his most enduring works. Hemingway beautifully captures the fragile magic of a special time and place, and he manages to be nostalgic without hitting any false notes of sentimentality. New York: Charles Scribner’s Sons, 1926. First edition of Hemingway’s first novel, one of 1250 printed. Octavo, original cloth. In near fine condition with a touch of shelfwear. An exceptional example. New York: Charles Scribner's Sons, 1940. 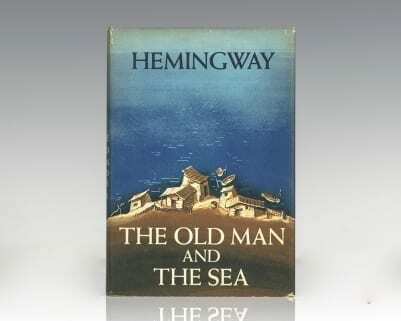 First edition with the Scribners A of the novel that is regarded as one of Hemingway’s best works. Octavo, original beige cloth. Fine in a near fine first issue dust jacket without the photographer’s name on the rear panel, with a touch of rubbing and a closed tear to the rear panel. A very nice example. First edition of Hemingway’s first novel, one of 1250 printed. Octavo, original cloth. Association copy, inscribed by the author on the front free endpaper to his nephews, “To Cliff and Dudley, with much affection, Ernest.” The recipients were Clifford and Dudley Bragdon, the nephews of Hadley Richardson, Hemingway’s first wife. Near fine in a very good dust jacket with some of the usual wear to the extremities. With the signature of the recipient, “Clifford R. Bragdon Paris 1927.” Housed in a custom clamshell and chemise case. 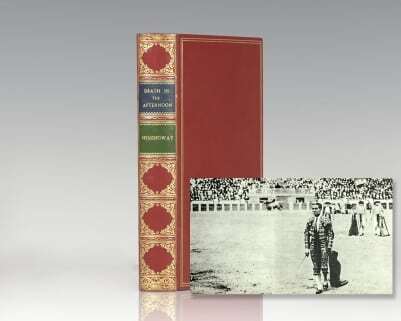 Association copies of Hemingway’s first novel seldom appear in the marketplace. New York: Charles Scribner's & Sons, 1952. First edition of Hemingway’s Pulitzer Prize-winning novel and one of his most famous works. Octavo, original blue cloth. Fine in a near fine dust jacket with light shelfwear. Photograph of Hemingway by Lee Samuels. An exceptional example. 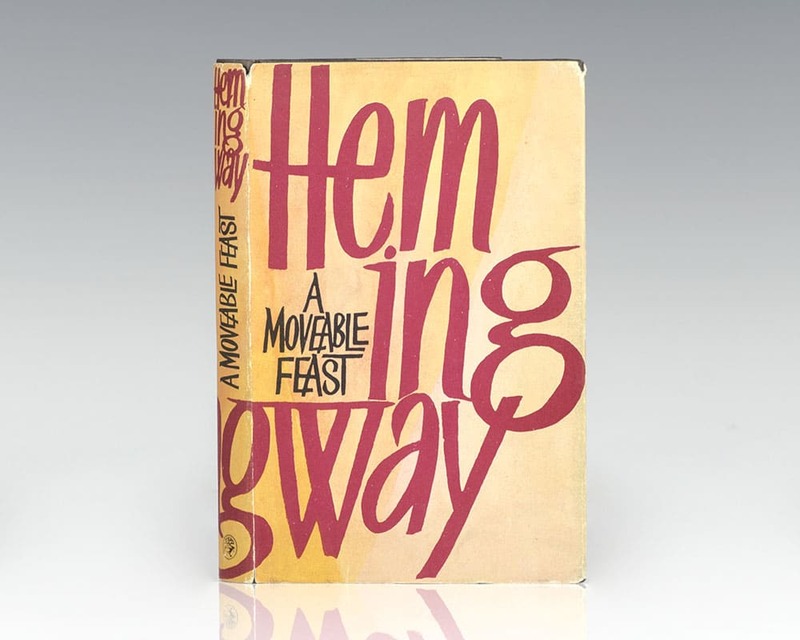 Signed limited first edition of this early Hemingway classic, which established him among the American masters. Tall octavo, original white parchment over green boards. One of 510 copies signed by Ernest Hemingway, this is number 67. Fine in the original slipcase which is in very good condition. Housed in a custom half morocco clamshell box. An exceptional example, scarce in this condition. First edition of Hemingway’s Pulitzer Prize-winning novel and one of his most famous works. Octavo, original blue cloth. Fine in a near fine dust jacket with light rubbing. Photograph of Hemingway by Lee Samuels. A very nice example. Three Stories & Ten Poems. Paris: Contact Publishing Company, 1923. 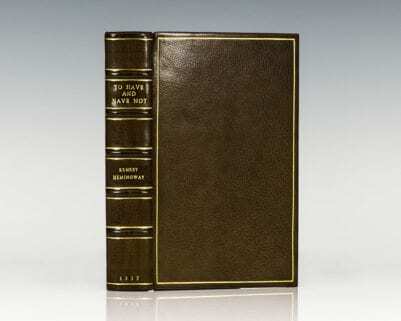 First edition, one of only 300 published. Small octavo, original blue-gray wrappers as issued. In fine condition without wear. Housed in a custom half morocco clamshell box. Signed limited first edition of this early Hemingway classic, which established him among the American masters. Tall octavo, original white parchment over green boards. One of 510 copies signed by Ernest Hemingway, this is number 128. Near fine in the rare original slipcase which is in very good condition, lacking the small bottom panel. A nice example. First edition of Hemingway’s Pulitzer Prize-winning novel and one of his most famous works. Octavo, original blue cloth. Fine in a very good dust jacket with light rubbing to the spine of the crown. Photograph of Hemingway by Lee Samuels. First edition with the Scribners A of the novel that is regarded as one of Hemingway’s best works. Octavo, original beige cloth. Fine in a very good first issue dust jacket without the photographer’s name on the rear panel, with some rubbing and wear to the extremities. First edition, first issue of the first printing, with the misprint (“stoppped”) on page 181 line 26. Octavo, original black cloth. In near fine condition, with a touch of rubbing to the extremities. An exceptional example. New York: Charles Scribner's Sons, 1964. First edition with “A-3.64[H]” present on copyright page. Fine in a fine dust jacket with a touch of shelf wear. Jacket painting of Pont Neuf, Paris by Hildegard Rath. First edition of Hemingway’s second work of nonfiction, an account of a month on safari he and his wife took in East Africa during December 1933. Octavo, original green cloth, decorations by Edward Shenton. Presentation copy, inscribed by the author on the front free endpaper, “To Gweneth P. Beam wishing her plenty of luck Ernest Hemingway.” The recipient was a secretary at Scribners at the time of publication when Hemingway inscribed this copy to her. Some light fading to the cloth as usual in a bright near fine dust jacket with light rubbing. Housed in a custom half morocco clamshell box. A very sharp example. First edition of Hemingway’s classic novel about smuggling, intrigue, and love. Octavo, bound in full brown morocco, gilt titles and ruling to the spine, raised bands, gilt ruled to the front and rear panels, marbled endpapers, all edges gilt. In fine condition. First edition, early printing of Hemingway’s Pulitzer Prize-winning novel and one of his most famous works. Octavo, original blue cloth. Presentation copy, inscribed by Ernest Hemingway on the half-title page in the year he received the Nobel Prize in Literature, “For Adele Ervin with sincere good wishes Ernest Hemingway Finca Vigía 1954.” Finca Vigía was Hemingway’s home in the San Francisco de Paula Ward in Havana, Cuba. He purchased the property in 1940 at the request of his third wife Martha Gellhorn who had become tired of the small room he was renting at the Hotel Ambos Mundos. It was at Finca Vigía that Hemingway wrote much of For Whom the Bell Tolls and The Old Man and the Sea in its entirety. Near fine in a near fine price-clipped dust jacket. 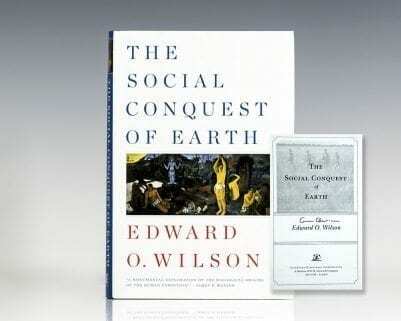 An exceptional example, most rare and desirable signed and inscribed. Octavo, finely bound in full morocco by Bayntun Bindery, gilt titles and tooling to the spine, double gilt ruled to the front and rear panels, inner dentelles, marbled endpapers, all edges gilt. In very good condition. Later printing of Hemingway’s early work on bullfighting. With eighty-one photographs. First edition of Hemingway’s first novel, one of 1250 printed. Octavo, original cloth. Near fine in a near fine dust jacket with light rubbing. A very sharp example. New York: Charles Scribner's Sons, 1933. First edition of Hemingway’s third collection of short stories. Octavo, original black cloth. Fine in a very good dust jacket with some rubbing and wear. A nice example. 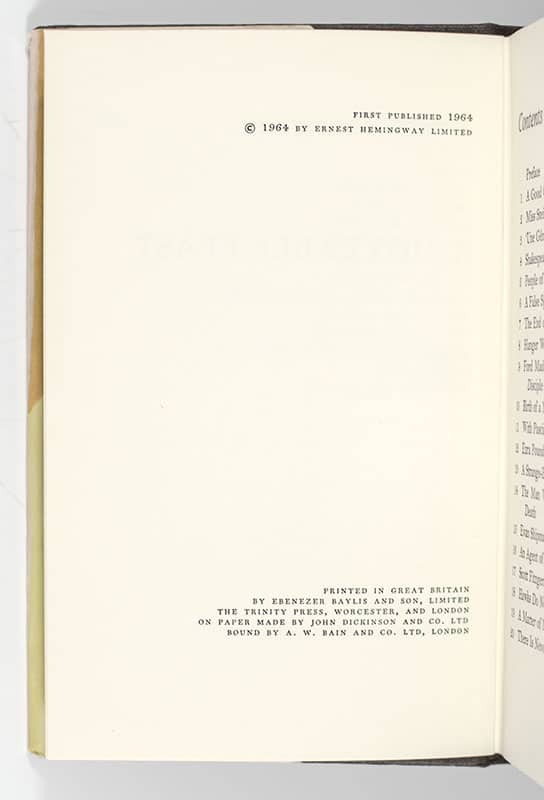 First edition, first issue of the first printing, with the misprint (“stoppped”) on page 181 line 26, in the first issue dust jacket with the misprint on the front panel (“In Our Times” vs. “In Our Time”). Octavo, original black cloth. Fine in a near fine first issue dust jacket without any restoration. The Annette Campbell-White copy brought $120,000 at Sotheby’s in 2007. Housed in a custom half morocco clamshell box. An exceptional example. 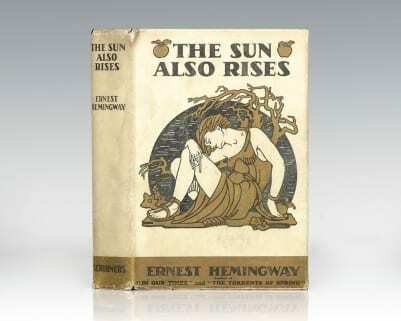 First edition, early printing of the novel that is regarded as one of Hemingway’s best works. Octavo, original cloth. Signed by Ernest Hemingway on the page following the front free endpaper. Fine in a excellent near fine dust jacket with a few small closed tears. Housed in a custom half morocco clamshell box. Rare and desirable signed by Hemingway. First edition of Hemingway’s second work of nonfiction, an account of a month on safari he and his wife took in East Africa during December 1933. Octavo, original green cloth, decorations by Edward Shenton. Contemporary bookplate to the pastedown, near fine in a bright near fine price-clipped dust jacket with light rubbing. A very nice example. First edition of Hemingway’s classic novel about smuggling, intrigue, and love. Octavo, bound in full brown morocco, gilt titles and ruling to the spine, raised bands, double gilt ruled to the front and rear panels, gilt signature to the front panel, marbled endpapers, all edges gilt. In fine condition. Ernest Hemingway Autograph Letter Excerpt Signed. Chicago: The Walden Book Shop, 1930. Rare letter excerpt boldly signed by Ernest Hemingway. 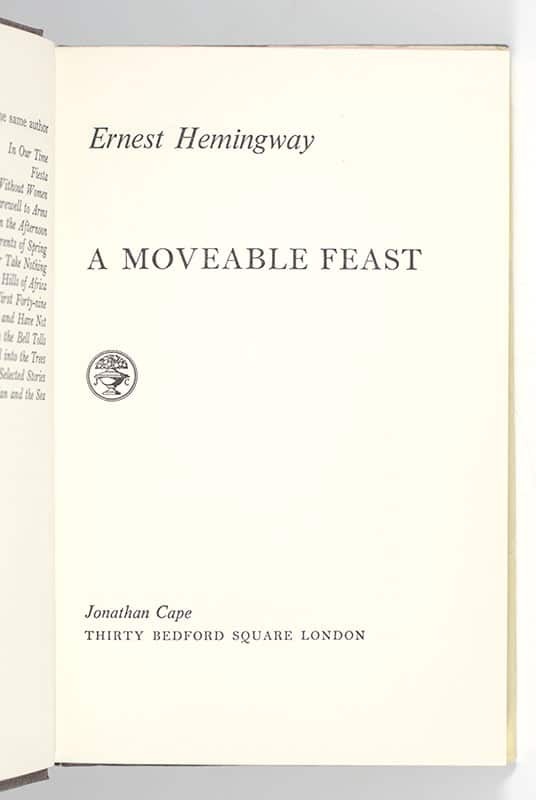 Published by the Walden Book Shop in 1930, the introduction begins "The following notes are excerpts from a Hemingway letter in answer to questions concerning editions and numbers of copies." It goes on to provide a long italicized quote from the letter in which Hemingway describes the printings of his early books from Three Stories and Ten Poems through the forthcoming Men Without Women (1927). The quote reads, in part: “…The books have been Three Stories and Ten Poems, Contact Press, 1953-350 copies out of print, In Our Times, Three Mountains Press, 1924, 150, I think…They claim to be issuing a new edition. Then Scribners published The Torrents of Spring in the spring of 1926 in an unrestrained edition and The Sun Also Rises came out in the same year with, I believe an attempt made to print and sell as many as possible…I own one copy of Three Stories and Ten Poems and would be very happy if it became valuable in order that I might have something to leave to my children.” Signed by Hemingway in he lower right corner of the pamphlet. In fine condition. Double matted and framed with a portrait of Hemingway. The entire piece measures 26 inches by 17 inches. An exceptional example. First edition of Hemingway’s classic novel about smuggling, intrigue, and love. Octavo, original black cloth. Near fine in an very good dust jacket with some rubbing and wear. Jacket design by Neely. Photograph of Hemingway on the rear panel of the dust jacket by Joris Ivens taken in Spain. A nice example. First edition of Hemingway’s third collection of short stories. Octavo, original black cloth. Fine in a near fine dust jacket with a touch of rubbing. A very nice example.